This month the From Left to Write Book club read Those We Love Most by Lee Woodruff. The story was about a family and the secrets that come to the surface after the death of their nine year old boy in a tragic accident. It chronicles how the family gets back on their feet after their loss and how they slowly begin to return to their lives, learning how to live their lives without James. We’re sort of re-learning how to live our lives too, only we haven’t lost our boy. We’ve gained a label, gained an answer, and gained some understanding. Asperger syndrome (AS), also known as Asperger’s syndrome or Asperger disorder (AD), is an autism spectrum disorder (ASD) that is characterized by significant difficulties in social interaction, alongside restricted and repetitive patterns of behavior and interests. It differs from other autism spectrum disorders by its relative preservation of linguistic and cognitive development. Although not required for diagnosis, physical clumsiness and atypical (peculiar, odd) use of language are frequently reported. What Are the Symptoms of Asperger’s Syndrome? The symptoms of Asperger’s syndrome vary and can range from mild to severe. Common symptoms include: Problems with social skills: Children with Asperger’s syndrome generally have difficulty interacting with others and often are awkward in social situations. They generally do not make friends easily. They have difficulty initiating and maintaining conversation. Eccentric or repetitive behaviors: Children with this condition may develop odd, repetitive movements, such as hand wringing or finger twisting. Unusual preoccupations or rituals: A child with Asperger’s syndrome may develop rituals that he or she refuses to alter, such as getting dressed in a specific order. Communication difficulties: People with Asperger’s syndrome may not make eye contact when speaking with someone. They may have trouble using facial expressions and gestures, and p understanding body language. They also tend to have problems understanding language in context. Limited range of interests: A child with Asperger’s syndrome may develop an intense, almost obsessive, interest in a few areas, such as sports schedules, weather, or maps. Coordination problems: The movements of children with Asperger’s syndrome may seem clumsy or awkward. Skilled or talented: Many children with Aspergers syndrome are exceptionally talented or skilled in a particular area, such as music or math. Attention deficit-hyperactivity disorder (ADHD, similar to hyperkinetic disorder in the ICD) is a psychiatric disorder or neurobehavioral disorder characterized by significant difficulties either of inattention or hyperactivity and impulsiveness or a combination of the two. According to the Diagnostic and Statistical Manual of Mental Disorders (DSM-IV-TR), symptoms emerge before seven years of age. There are three subtypes of the disorder which consist of it being predominantly inattentive (ADHD-PI or ADHD-I), predominantly hyperactive-impulsive (ADHD-HI or ADHD-H), or the two combined (ADHD-C). Often people refer to ADHD-PI as “attention deficit disorder” (ADD), however, the latter has not been officially accepted since the 1994 revision of the DSM. ADHD impacts school-aged children and results in restlessness, acting impulsively, and lack of focus which may impair school performance. 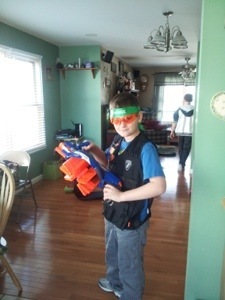 Yes, that’s my boy. Yes, he has Asperger’s. Yes, he has ADHD. Yes, we’ve gotten a second opinion. And both doctors came to the same conclusion. It’s not an easy thing to accept. Or an easy thing to talk about. Or an easy thing to understand. But I wouldn’t trade him for the world. 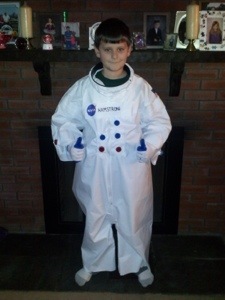 Just this weekend he went with his Boy Scout Troop on his very first camp out, 4 1/2 hours away, without me or his dad. I worried and worried and worried, and cried and cried and cried, but he came home hungry, dirty and smiling from ear to ear. He had a FABULOUS time! And he hasn’t stopped talking about it. Now we know why he does the things he does. Now we know why he’s obsessed with his video games, and why he loses his mind when something doesn’t work out the way he thinks it should or when he doesn’t understand something the first time around. It’s because his brain doesn’t work the same way ours does. He expects to know the answer the very first time a problem is presented to him. He expects that his video games will always work and never break or malfunction or die. People I’ve mentioned this to have said to me, “He’s just being a little boy.” Yes, he is, and I intend to keep it that way, but my little boy and your little boy and two different boys and my little boy is the one other little boys call “weird” or “strange”. And my little boy will be the one who will get bullied and picked on because he is “weird” or “strange”. Unless I get him the help he needs. One of the neurologists I saw told me that I have to teach him how to “mask” his “quirkiness”. He needs to learn how to hide what makes him who he is so he can fit better into society. I’m not sure I want that for him. I AM sure that I just want him to be a little boy before is too late and he has to be a grown up. I AM sure that I want him to have the best summer ever, every summer, and I will MAKE SURE that happens for him and his sister. And I AM sure that he is MY little boy and I will love him NO MATTER WHAT. God gave him to me for a reason, and I am honored to be his Mommy. This is an original ROSCMM post and was written for the From Left to Write Book Club. 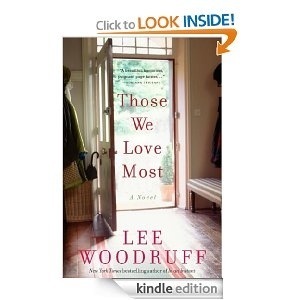 This post was written in response to Those We Love Most by Lee Woodruff an ebook copy of which I borrowed fro the library for the purposes of this post. And no, you can’t steal my content, it’s called copyright, yo. I think you have a great attitude about this journey. You have to do what’s right for you and your son. Also, how awesome was it that he loved his camping trip! Pingback: Book Club Day: Those We Love Most + Win Video Chat with Lee Woodruff! Such great words. Person first language/behavior/actions is so important. And I agree that he is a person first, no matter what “label” is attatched to him in order to help him thrive and succeed in life. It sounds like he has an awesone Mom on his team and will do great!